Too Many T’s have crafted a faithful following with their Golden Era Hip Hop formula; positive vibes, trademark back to back, rapid fire flows and turbo-charged performances. With over 150 shows in the last 18- months, The Dynamic Duo of Rap have seen their party vibes and humour take them from back-alley obscurity to the prime-time radar, right across the nation. They have played in front of tens-upon-thousands of people. In the summer of 2013 alone, The T’s graced stages at Beat Herder, Secret Garden Party, BoomTown, Shambala, V South, Late Nights (Switzerland) as well as 10 other festivals. They also performed at both Bestival and Camp Bestival, as well as hosting the main stages. Championed by music industry figures such as John Kennedy and Rob Da Bank and now considered to be one of the UK’s freshest live Hip Hop acts, Too Many T’s have turned heads and pricked ears with both music fans and press alike. The Huffington Post was quoted as saying that the guys are ‘The UK’s answer to the Beastie Boys’; quite an accolade, but an accolade that the T’s are living up to. 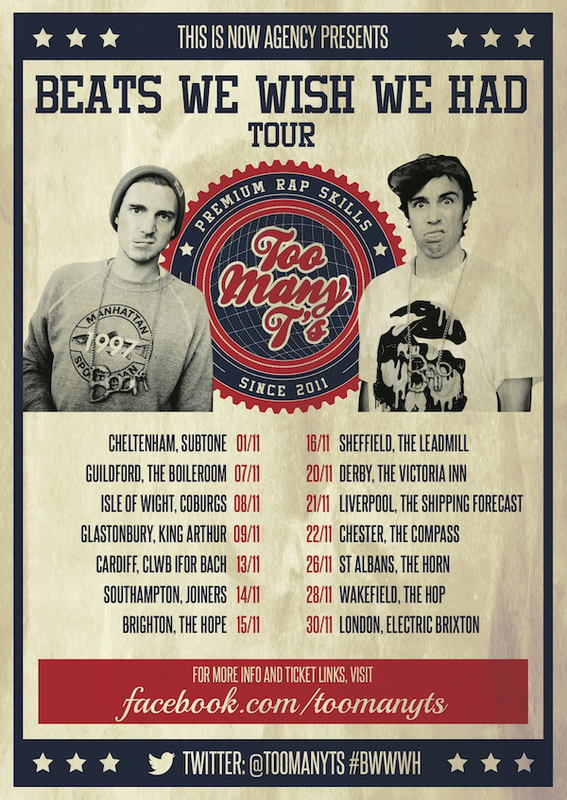 With the self-recorded mixtape ‘Earl Necks and Round Grey’ and their debut studio EP ‘The T.P’, already under their belts, Too Many T’s will be releasing the 4-track EP ‘Beats We Wish We Had’ in November to accompany their biggest UK Tour to date. Tickets go on sale at 9am on Monday 30th September.